I wanna give you something free. I love art but there are times I worry I’m doing it wrong. Like when I go to a Chelsea gallery and I am mystified by what’s hangin on the walls. Or when I go to the Met and am absolutely knackered after just half an hour of walking around. Or when I can’t remember whether it’s Manet or Monet. Or when I find myself getting super irritated by the way other people behave in the Whitney, snapping Instagrams and saying inane things about the Biennial. I never studied art or art history and, truth be told, there are times I feel like I have missed something significant. It’s like drinking fine wine or watching the NFL; I can’t tell what I actually like or have any idea how to discuss it. It all just seems sort of heavy — unnecessarily so. That’s why I wanted to use my role at Sketchbook Skool as an excuse to learn more and fill this deficit in myself and my friends. When my pal Bridget wrote a book on the subject, a sort of primer on art appreciation without fear, loathing and manbuns, I thought it would be worth spending some time bringing it to life in an online kourse. We spend months working on it, turning a book without illustrations into a dozen and a half visually dynamic videos, full of cool locations and special effects and animations to make the ideas come alive. But the fact is that we rarely talk about art the way we talk about movies or Netflix shows (or maybe I just have the wrong friends).We don’t have the guts or the vocabulary, we feel pretentious, we don’t know how or with who to talk about it. Yes, you too, with your yellowing Art History diploma, when was the last time you just sat around with some pals guffawing about Dan Flavin? Gimme a break. Any way, let me stop insulting you long enough to ask you to join me on Monday when our new kourse, How Art Can Make You Happy debuts at Sketchbook Skool. It’s less than a latte and a ticket to MOMA and it’ll just take you a jolly afternoon to absorb it. I really want to hear what you have to say and this will be a safe and fun place to do it. I hope to see you in klass. Or I’ll snub you at the Gug. P.S. 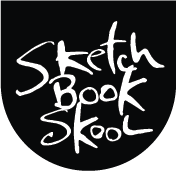 And, because I love you and really think this will be worth your while, I’ve convinced the brass at Sketchbook Skool to give you a sample lesson, absolutely free. You’ll have to pay for the rest when you sign up for the kourse here. Next Post Pad and i: Part 4. Guttenberg Comes Alive! Danny you really are a wonderful troublemaker or provocateur. Though I think I have one of your numbers. I am already signed up and plowing through Bridget’s book with a vengeance (like I did with Shut Your Monkey) and she has opened up a perspective for me which I think is worth at least 2 years tuition at an art college. Who knows perhaps even four years depending on how much I apply myself. Starting on page 17 of her book she dives into what for me is the crux of the matter. Anyhow I have said it and posted it, “this klass will become a Sketchbook Skool klassic.I know I sound a little over the top but getting close to 4 years and the value you guys deliver is priceless to me. How about that Tommy Kane’s new book, great huh? Thanks as always for your thoughtful comments, Robert. I think you’re right — we should be packaging Monkey, Happy, and Kane’s book as a replacement for 4 years of art school. Would have saved me a quarter of a million bucks if I’d bought em for Jack. Thanks for the sneak peek, Danny. I find it really interesting how such a cheerful, upbeat theme can feel so much heavier and darker by just lowering it by a full tone – curious choice for this particular klass. I look forward to beginning on Monday and to delving into Tommy Kane’s new book on Christmas Day. Danny I love your blog and work but is it really necessary to put down art schools and certain types of art? A book can never replace the experience of 4 years of art school. You sound like some of my more traditional artist friends who think anything not painted in the style of Bouguereau or the Renaissance is crap. I don’t think that’s what you really mean but I get tired of artists attacking each other. You’re right, I don’t mean to attack artists, Patricia. And I am not some crusty, musty, staunch traditionalist and love lots of contemporary art. But I haven’t been trained on how to look at it. And I find that when I look to the gallery, academic art history, and art critical establishments for guidance, a lot of it incomprehensible and jargon-laden. And I believe it’s intentionally so, to preserve the mystique of the gate keepers, the insular, uninviting and overly academic institutions. I’ll gripe about them and I’ve been doing that for a long time. I watched the video and immediately registered. I had not planned to take this class. Your marketing skill are excellent. I, however, am glad you are focusing them on SBS now. I am persuaded to jump off that fence. And…I have begun jumping every time. Have loved every class and especially being able to go back to them. Wonderful, Lori! You totally get it. Our television has a setting where it shows various artworks from Google Art Project as a slideshow. I guess it’s meant to be a screen saver or wallpaper or something. Sometimes my husband and I sit and critique/enjoy the art as it comes up. It feels pretentious, but it’s quite fun and there’s no one around to judge. When I used to read your posts, I felt like you were talking to me. Now everything that comes from you is another ad for the current course. Everything I read now from Sketchbook Skool is an ad. So many ads!! I am feeling a loss. I’m sorry you feel that way. Admittedly (And I did admit as much in a recent post) I have not been writing enough new stuff here and I am trying to get back in the habit. I also hope that you don’t think of the Sketchbook CLub videos as needless propaganda. I know you’ve taken a number of kourses with us, Sarah, but given that a lot of the visitors to this blog don’t get info on what we are doing on social media or our emails, it may seem less redundant to them. Nonetheless I will keep your complaint at the front of my mind and be as circumspect as I can about announcing new kourses here. Thanks for sharing your POV here, Sarah. I hope to hear from you again. I also hope that you are getting our zine which is a not an ad but a gathering of cool stuff we like.